First of all, Hungary is a member of the European Union, but they have not started with the Euro yet. Many places you can still pay with Euro, but expect to receive forints back. If you do pay with Euros the shops normally give you little for your Euro, so you would do better to go change your Euros, and then go back into the shop and pay with forints (for example in McDonalds). But, due to the financial crisis going on around the world, the calculation is going up and down. It was a time when you had to pay 230 forints to get one Euro, and there have been times when you have to pay 320 forints to get one Euro. 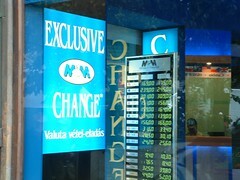 That is why we want to give you some good advice concerning changing money in Budapest. 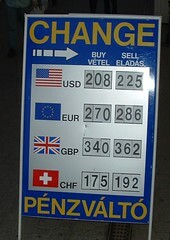 The places where you can change your money is always up to date on the latest values of the forint, so they will always know how much it is worth. They earn their money through you paying more for a forint than it is originally worth. But, someone lets you pay much more, others just a little bit more. So, how can I know that I receive a good rate? In times of big changes (when the forint is very unstable), the differences will be greater than normal. So in quiet times, you can expect a difference on around between 5 and 10 when buying or selling forints for euro. If the market is unstable you can expect this to be between 15 and 20. One picture below is taken in a stable period, the other in an unstable period. The Euro difference at this picture is 6. You sell for 239, and buy for 245. The Dollar difference at this picture is 6. You sell for 169, and buy for 175. This picture was made in September 2008. The Euro difference here is 16. You sell for 270 and buy for 286. The Dollar difference at this picture is 17. You sell for 208 and buy for 225. This picture was made in October 2009. It is quite normal in Hungarian to tip in restaurants, but it is also normal to tip guides, hairdressers and taxi drivers. It is not normal to bargain as you shop, except from in the Big Market Hall and in open air markets. How much does it cost to get some Hungarian Forints? Do you wonder what things cost in Budapest? Here you can find some price examples. Want to spend your money on something else? Check out the different wine tasting opportunities, or get more information from a private guide during on of our guided tours. If you have any questions concerning the currency in Hungary, about changing money, about exchange rates or whatever that deals with your travel to Budapest, visit our frequently asked questions page and ask there..
Can I use euros in Budapest?